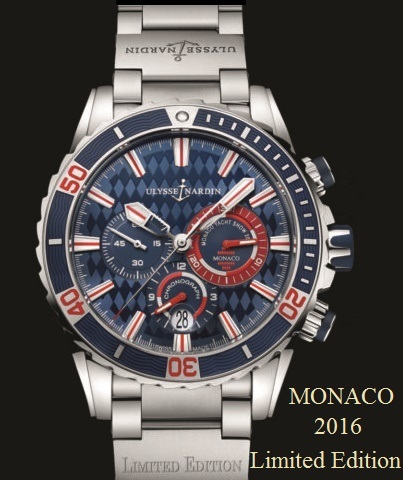 Ulysse Nardin is the Official sponsor of the MONACO YACHT SHOW, the most prestigious yacht show in the world. Held once a year in Port Hercules in the Principality of Monaco in the presence of Prince Albert III. This is the LATEST Monaco Limited Edition. It is a stainless steel 44mm case, chronograph with date indicator, automatic movement, and features an exhibition glass back. The royal blue color dial features the colors of the Monaco flag, and MONACO YACHT SHOW 2016. It is shown on a stainless steel bracelet.